Please send me a price for the CPP200/PE new 32x24 plastic pallet. This 32x24 half pallet is the US equivalent measurement for the 800x600mm Euro half pallet and is favored in retail settings. Used primarily in retail stores, the Half Euro pallet is formally identified as the EUR 6 by the European Pallet Association (EPAL). The ventilated top deck of this plastic pallet provides good airflow plus the open design works well when strapping product. The CPP200/PE plastic pallet has just 6 feet. The small base saves floor space and easily moves through doorways. The low profile nesting design of the CPP200/PE plastic pallet saves space when empty for lower storage return transport costs. Combining low weight with high strength makes new pallets more affordable than ever for better performance at a lower cost per trip. Plastic pallets like the CPP200/PE are lightweight and durable. Its uniform length and width provide ease of use and safety. A lower cost plastic pallet like the CPP200/PE lets you ship it out and erase the fiscal worry that comes with pallets not coming back. Place packaged foods and drinks on this food grade plastic pallet. The plastic design is easy to clean in the event of a break or spill. One-way plastic pallets like the CPP200/PE let you send it and forget it making this a competitive alternative to pallet return options. Get more turns using the CPP200/PE multi-trip plastic pallet and easily win back startup costs with durable and reliable plastic. Use the CPP200/PE captive plastic pallet in closed loops to satisfy in-house reusability requirements with the reliability of plastic. Choose this plastic export pallet for guaranteed acceptance at all ports without the hassles of delayed shipments or expired paperwork. 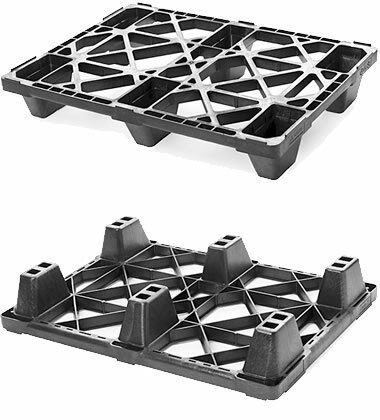 Save costs when shipping cargo via air with the CPP200/PE air freight plastic pallet. Perfect for single use and one-way air shipment. Supporting 2,200 lbs of dynamic load when moved by a forklift or hand jack, this pallet works well in heavy duty applications. Available in Truckload or LTL quantities. Minimum quantity required. We reserve the right to change any stated information without prior notice. Not responsible for typographical errors. Is the CPP200/PE the right pallet for you? Yes I'm ready! I would like a price please. Smart. Letting an expert help for free. Lucky too. Our pallet know-how saves money. ©2002-2019 The Nelson Company. All Rights Reserved.